Seedless green and purple grapes cold from the refrigerator have a way of burst ing a summer gush of refreshment right there in your mouth! This simple, delicious healthy salad is perfect for a dinner side dish. I make a lot, as this dish seems to call for just one more spoonful.. just one more and more and so on. Wash grapes and remove pieces of stems, drain so they are not dripping water. 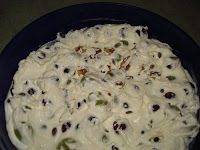 In a mixing bowl combine cream cheese and sour cream. Add sugar and mix. Place grapes in a large serving bowl and scoop the cream mixture over grapes. 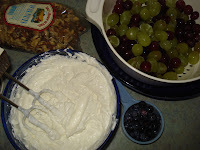 Add nuts, and if desired other berries. Refrigerate to bring back the chill of the grape. Serve immediately and watch it go!